Looking for a dentist in Vancouver, WA? Welcome to Hazel Dell Dental Care, the dental office of Dr. Lyle Kelstrom. At our state-of-the-art practice, we are committed to providing our patients with the highest quality dental services in an environment that is warm and welcoming. 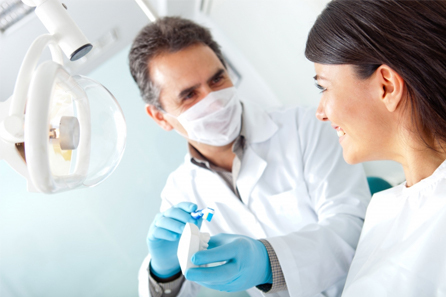 Using the latest equipment and techniques, our skilled and experienced dental staff will handle all of your oral healthcare needs including general, restorative, cosmetic and family dentistry. We feel that one of our most important functions is to listen to our patient’s concerns and educate them as to their best options in handling their dental health issues. Our mission is to provide our patients with a gentle, anxiety-free dental experience and send them home with healthy and beautiful smiles. Vancouver dentist Lyle D. Kelstrom has been serving Vancouver, Washington for More Than 35 Years! We at Hazel Dell Dental Care know how important it is to provide dental services that your whole family can count on. • Dental Bridges. This service makes teeth look natural when one of more teeth are missing. • Dentures. We can fit your mouth with artificial teeth to help create a lovely smile and improve your chewing. • Fillings. We offer amalgam, composite, gold and porcelain fillings. • TMJ Treatment. The temporomandibular joint is a common cause of neck and head pain, and our staff offers treatment. • Tooth Extraction. This removes problem teeth, and it can be done in a less painful way than ever before. • Root Canal Therapy. You may need a root canal when the nerves of your teeth have been affected by infection or decay. We also offer basic dental services such as teeth Whitening and cleaning. We can help you straighten your teeth with the proven Invisalign® system as well. Best of all, we’re here to answer any questions and walk you through the entire process. • Myofascial – pain or discomfort in the muscles that control the jaw. • Internal Derangement – pain involved with the dislocation or displacement of the jaw. • Arthritis – pain as a result of inflammation and degeneration of the joints in the mouth. We seek to provide compassionate, detail-oriented care for these issues. not only has fluoride, a natural cavity fighter, but it also helps fight off dry mouth, one of the leading causes of tooth decay. At Hazel Dell Dental Care, we are proud to have Dr. Kelstrom as our leading dentist. Rated as a top dentist in 2016 by Portland Monthly, Dr.
Kelstrom knows what it means to put your family’s needs first. As the father of three and grandfather of three, Dr. Kelstrom puts a big emphasis on quality care for the whole family. Dr. Kelstrom was born and raised in Vancouver, so he takes great pride in serving his hometown community. We are always excited to welcome new patients at Hazel Dell Dental Care. When you’re looking for the best dental care services in Vancouver, look no further than Hazel Dell Dental Care. We respond quickly to appointment requests because we know you have a busy life, and finding time to see a dentist in Vancouver can be time consuming. We hope you will find our website to be a helpful and informative tool and we welcome you to call us with any questions that you may have regarding our services. We look forward to becoming your lifelong dental health care provider and helping you achieve the smile of your dreams. Call our office today for a dentist appointment!